We do this in one of three ways: ink printing, hot stamping, or our newest option of screen printing. Click the printing methods below to learn more about each option. Going green doesn't have to mean loosing quality. With this process we create a cloth screen where the ink is pressed through onto the bag. 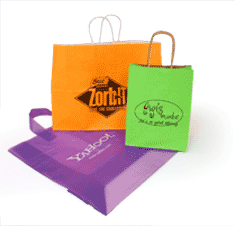 It is ideal for printing on our durable Non-Woven bags. It is a great way to let your customers know you care.